Home to more than two dozen major rivers and lakes, Tennessee is one of the best states in the country to learn how to paddleboard or to fine-tune your skills. From sweet, glassy lakes perfect for newbies to river stretches that will give even the most experienced stand-up paddleboarders a run for their money, paddling opportunities in Tennessee are almost endless. But that means there’s a lot to choose from, so we’ve narrowed it down to some of the best spots, with a little help from a local expert, too. Today began with a 6 mile sunrise SUP with @lindsayford @bford123 and @joeynicotra. So beautiful and so fun!!! Weaving through both modern and historic elements of Tennessee (think breweries in buildings that have been around for ages), this 26-mile stretch of water is often referred to as the Tennessee Blueway. Local paddleboarder Chris Murphy of Chattanooga Paddleboards cites this spot as his absolute favorite in the state. "The River Gorge is, hands down, the best place to paddle. It’s where Chattajack is hosted. It twists and turns all through the gorge. It can also be a challenge or it can be a somewhat easier paddle depending on the day," Murphy explains. Once you’re done paddling for the day, relax and rub elbows with locals at one of the hoppin’ breweries Chattanooga has to offer (the Chattanooga Brewing Co. or Hutton and Smith are solid places to start). "If you’re just learning to paddleboard, you’ll want more of a lake setting," Murphy notes. For top notch lake paddling in Tennessee, look no further than Chickamauga Dam Recreation Area. Its location above a dam means very flat waters for a calm, easy paddle without the currents you’ll find in more challenging locations. The water here is shallow and the beaches are plentiful if you like to alternate between paddling and sunbathing. Happy Valentine's Day ! Let us celebrate our love for nature and our love for each other today and every day ! The best part about paddleboarding at Ijams Nature Center is the variety of options you’ll find. 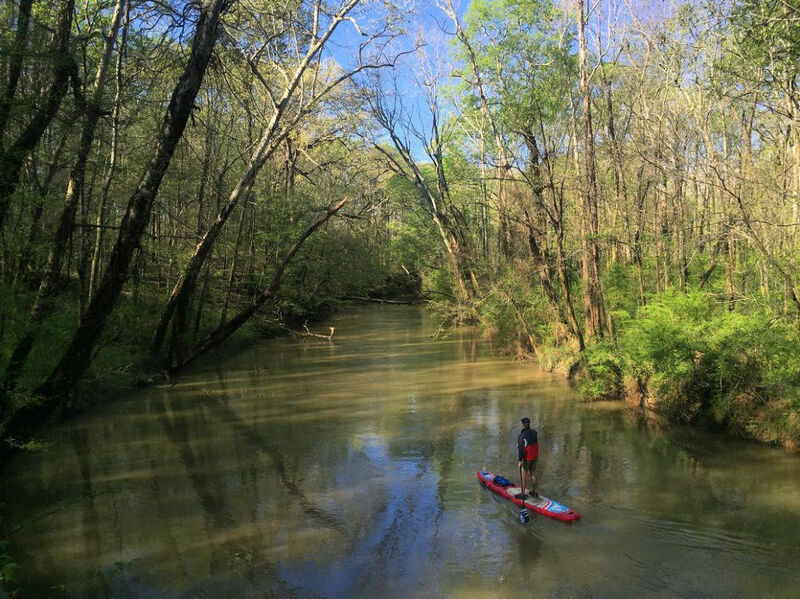 Take a relaxed paddle around Mead’s Quarry Lake and look for freshwater jellyfish (it’s perfect in the summer) , or up your game and jump on the Tennessee River, flowing right through the nature center. If you don’t have your own board, you can rent one at Mead’s Quarry Lake. After you’re done paddling, take a walk along one of the many trails, go for a swim, or hop on your mountain bike. Self-dubbed as "one of East Tennessee’s best-kept secrets," Norris Lake is the perfect spot for intermediate paddlers. It’s still a lake, so there’s no current of course, but you will have to manage the extra obstacle of boaters on your adventure. “Just watch out for boat traffic—they can tend to get pretty close to paddleboarders without realizing it,” Murphy says. Whether you are planning to put in some serious paddling time or looking for a tranquil summer vacation, Norris Lake has marinas, restaurants, as well as plenty of accommodation options and equipment rentals—everything you need for a perfect summer escape. Cypress trees at Reelfoot Lake, TN. Offering some of the quietest and most idyllic waters in the state, Reelfoot Lake in northwestern Tennessee is a unique experience. This spot is the largest natural lake in the state, formed by earthquakes in the early 1800s, and is home to more than 200 species of birds, including at least 14 rare species. Take your time to paddle among the cypress trees sprouting up from the water, as the water depth is only about five feet in most spots. Paddling here will plop you right in the middle of the oldest lake in the Cherokee National Forest. Parksville Lake spans over 1,900 acres, with tons of nooks and crannies to explore. Keep your eyes peeled for bald eagles as you paddle along the shoreline, and go midweek if you want to avoid the crowds. Once you’re all paddled out, head over to Parksville Beach for a swim and a picnic, and spend a couple nights at the campground of the same name if you really can’t peel yourself away. Percy Priest Lake is all about the island camping. Paddling around it’s "blue waters and limestone-lined shores" practically goes hand in hand with spending a night under the stars. Head out right before dusk to catch a sunset, and pick an island to set up camp (there are more than 30!). Each island is marked with a sign as to whether or not camping is allowed, and you can expect a primitive experience. Long popular with canoeists and kayakers, SUPing has made a splash on the paddling scene at Nickajack Lake. Once on the water, set your sights on the Nickajack Cave. It was once a center point for Native American culture for traditional ceremonies, but these days you’re more likely to stumble across a nest or two of bats when the weather is warm. It’s about a mile paddle, depending on where you put-in, and is great for families. Based on this lake’s location alone—nestled between the Great Smoky Mountains National Park and the southern section of the Cherokee National Forest—you know you’re going to be in for a beautiful session. Not only are the waters friendly and easy to navigate, but they’re also surrounded by some of the best scenery that Tennessee has to offer. On Chilhowee Lake, you’re much more likely to encounter a boater asleep at the wheel with a fishing line dangling in the water than a speed demon on the run, making for a much more relaxed lake paddle then you’re usually able to find anywhere else. Note: Chilhowee Lake has been closed for repairs on the dam, but is supposed to reopen in June 2017.